I recently started to work on an Open Source SIP project called OpenMRS, and realised that most (if not all) of the unit tests are actually integration tests. The way the OpenMRS code (and test) base uses the Spring IoC is I believe a large part of the problem. Although I am not a big fan of DI, I think there is value in using the Spring IoC in some cases. But there are some pitfalls to avoid, and good practices to follow. Nowadays, spring contexts seem to be so embedded in Java applications that developers forget that they are meant to be treated parsely, and with caution. One good example of this symptom is the one-big-fat-a*** (OBFA) applicationContext file for the entire stack. Having an OBFA spring context file makes the customisation of parts of it more difficult and dangerous. spring-appcontext.xml Root Spring context file e.g. 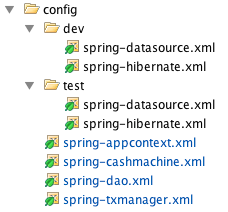 spring-cashmachine.xml Domain Service config e.g. spring-datasource.xml Database connection config e.g. spring-txmanager.xml Transaction Manager config e.g. With this structure, if the app is deployed locally, then the build script will take the spring files in the dev directory. Similarly, if unit tests are run (e.g. in your build pipeline), the files in test would be put on the classpath. In that case, each test-specific spring config file’s name starts with spring-test. So the files can stay on the classpath (no need to swap through build script), as they will not clash with the default config, and will only be used by unit tests. Most OpenMRS JUnit tests extend BaseContextSensitiveTest, which loads the Spring context applicationContext-service.xml for the Application Services, hence automatically wiring the DAOs. Because of that, the service unit tests do not mock nor stub the DAOs. The first issue here is that they are not unit tests but integration tests. The second issue is that it becomes very difficult to write proper unit tests (with mocked dependencies) using the same context without breaking other tests. pws is an instance of ProgramWorkflowService obtained from the Spring context. By doing so, I actually ended up screwing-up all other subsequent unit tests whose class under tests depends on ProgramWorkflowService (since dependencies are obtained from the same context). So, by mocking a dependency of my object under test, I unexpectedly modify the behaviour of the code in another part of the application! 1. Split config files into small files, and make environment specific those that need to be. 2. Use the IoC only for integration tests, in which case use the @ContextConfiguration annotation on a layer supertype of all your integration tests. 3. Do not use the IoC for unit tests: instantiate, mock, and inject through setters in the @Before method manually. This entry was posted in Software and tagged integration-testing, java, mock, spring, unit-testing by jeandamore. Bookmark the permalink.